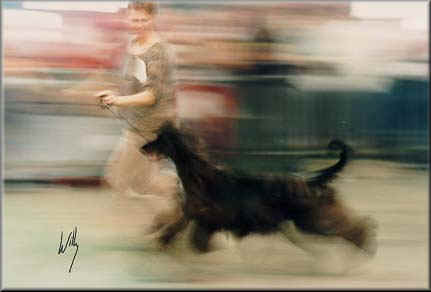 Since 1967 Lotte Jørgensen has been active in the world of dogs, and though Lotte has been flirting with other breeds, the Afghans has always been closest to the hearts of the Jørgensen family. Since the very start, several breeds have been produced under the Boxadan trademark. Lotte started her edjucation as a jugde in 1986. Afghan of course, and is now licend to judge 38 different breeds. Lotte and Ulf are fully dedicated to their interest in breeding Afghans. Though while Lotte is out judging, Ulf is acting as kennel-boy, and organizing shows and many other activities in the dogworld.